Whether pregnant or planning a pregnancy, future parents benefit from timely information related to health before pregnancy, prenatal health, labour and birth, postpartum health, parenting and infant care. 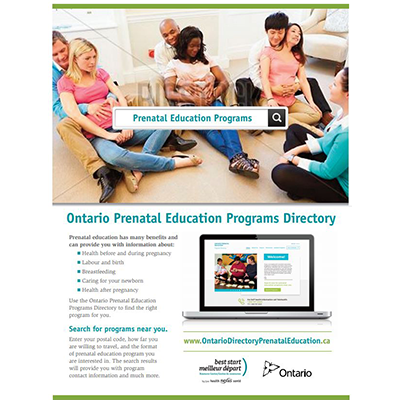 This searchable online directory helps future parents future parents to find prenatal education programs near them in Ontario, that fit their needs. This bilingual flyer can be printed and distributed to future parents to promote the directory. This is a bilingual resource. See also our bilingual postcards and our web banners available in 1651×1640 in English and in French, and in 2096×853 in English and in French.